March 3, 2015 (Phoenix, Arizona) – , a new product by The Wikki Stix Co, has officially launched. The Wikki Stix brand is owned by Omnicor, Inc., a company based in Phoenix, Arizona. 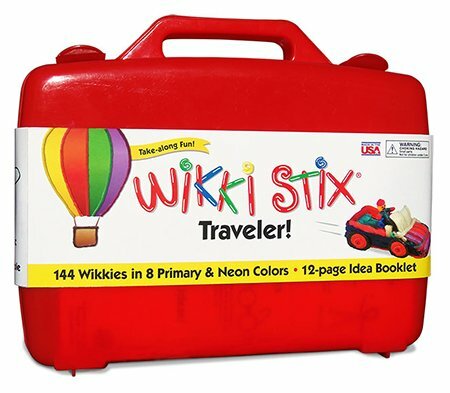 The Traveler makes it easy to keep kids quietly and happily entertained without, “Are we there yet?” Bright, colorful carry case contains 144 Wikki Stix, 12-page activity book of ideas and illustrations, plus a QR code with even more instructions and Wikki fun! There’s also a colorful I.D. sticker to personalize the case. Not just for major trips, The Traveler is great to have along any time. Retail price: $19.95. • I.D. Sticker to Personalize. Wikki Stix are a versatile, creative activity toy providing hands-on fun for all ages! The product is made of hand-knitting yarn enhanced with a microcrystalline food-grade, non-toxic wax. Wikki Stix work without glue or paste, so there is no mess–simply press down with light fingertip pressure. Wikki Stix adhere to almost any smooth surface. Wikki Stix are safe, gluten free and non-toxic. Ideal for ages 3 and up. Made in the USA for more than 25 years. Omnicor, Inc. is far better known simply as the Wikki Stix Company. Wikki Stix, One-of-a-Kind Creatables, is the multiple award winning original waxed yarn creativity toy. It’s a small, friendly and playful company with the wonderful task of producing a unique and amazing product to delight, inspire and entertain children, while bringing peace, quiet and joy to parents and grandparents!